Carrying out hand mixing of concrete requires special skills and care during the process for quality control of fresh concrete. The precautions and the correct way of performing hand mixing of concrete is to undergo the mixing process as recommended by the standard procedures. Concrete is mixed by any two methods, based on requirement as per quality and quantity of concrete required. Normally for mass concrete, where good quality of concrete is required, mechanical mixer is used. Mixing by hand is employed only to specific cases where quality control is not of much importance and quantity of concrete required is less. Stone aggregate is washed with water to remove dirt, dust or any other foreign material before mixing. The main purpose of mixing the concrete is to finally obtain a uniform mixture that shows uniformity in terms of color and consistency. Measured quantity of sand is spread evenly. The required quantity of cement is dumped on the sand and spread evenly. The sand and cement is then mixed intimately with spade, turning the mixture over and over again until it is of even color throughout and free from streaks. The sand cement mixture is then spread out and measured quantity of coarse aggregate is spread on its top. Alternatively, the measured quantity of coarse aggregate is spread out and the sand cement mixture is then spread on its top. The whole mass should be mixed at least three times by shoveling and turning over by twist from center to side, then back to the center and again to the sides. A hollow is made in the middle of the mixed pile. Three quarters of the total quantity of water required should be added while the materials are turned in towards the center with spades. The remaining water is added by a water-can fitted with rose head, slowly turning the whole mixture over and over again until a uniform color and consistency is obtained throughout the pile. 5 percent extra cement shall be added than the specified for machine mixing, when hand mix cement concrete is produced. The required PPEs (Personal Protective Equipment) shall be worn by the labors and masons while mixing and handling the concrete. The mixing platform should be washed at the end of the day. The Hand Mixing procedures have to be carried out only for small concrete works. Large works will ask for large quantity of concrete at a time, for which we must use either a machine mixer or ready mix concrete. The hand mixing must be employed only for works that will give adequate interval time for mixing between the work. This means we must not mix large quantities very earlier for a work that is going to start later. The mixing procedure have to be conducted on a water tight platform. This platform have to be impervious. This can be either a concrete platform or a brick floor. The floor must have the space to take one bag of cement at a time and their respective materials (water + aggregate). Initially, the measured quantities of cement and fine aggregate is mixed properly over the watertight platform. The mixing is continued till a uniform mixture is obtained. The coarse aggregate has to be placed over this bed of uniform mixture. An inappropriate order of addition of material must not be followed. The addition of water must be done in intervals and not in a single stretch. The whole mixing must be done neatly and uniformly without a hurry. A good and clean showel should be used for the mixing procedure. During hand mixing, it is recommended to avoid large buckets for measurement. Use of large buckets will end up having a large heap that is difficult to be mixed by hand. In some cases, the large heap is divided into two large heaps and performed individually. This can be only carried out by one will proper skill and experience. Every time after the use, the worming space have to cleaned and made free from any debris. The main issue faced in hand mixing is the addition of too much water that required. This must be avoided. The workers carrying out the concrete mixing are asked to use masks so as not to inhale the powder, which can cause serious issues as time passes. 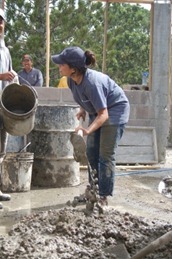 For inside concrete works, avoid the hand mixing procedure in the outside or direct sun. This increase in temperature will evaporate the water content, hence making the mixture dry. 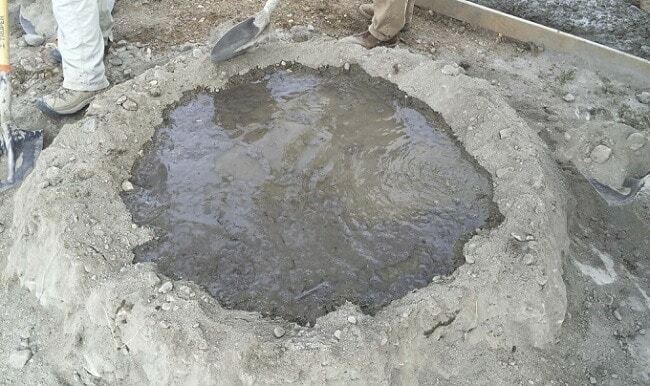 Over mixing of the concrete mixture have to be avoided. Once the required amount of mixing is performed, keep it idol and mixing in small quantities during the time of placing.